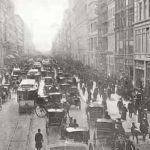 Victorians and Edwardians were fond of traveling. ‘The Grand Tour’ – a travel through European countries – was a popular travel to finish the education of wealthy young adults. Italy and Greece were the most popular travel destinations, and some even traveled to the Far East! The advent of the railroad and steamships in the Victorian era made traveling much easier. In the Victorian era, there were already unchaperoned traveling women, such as Ida Pfeiffer – the travel blogger of the Victorian era! 😉 While Edwardian women and men sometimes preferred trips by bicycle. 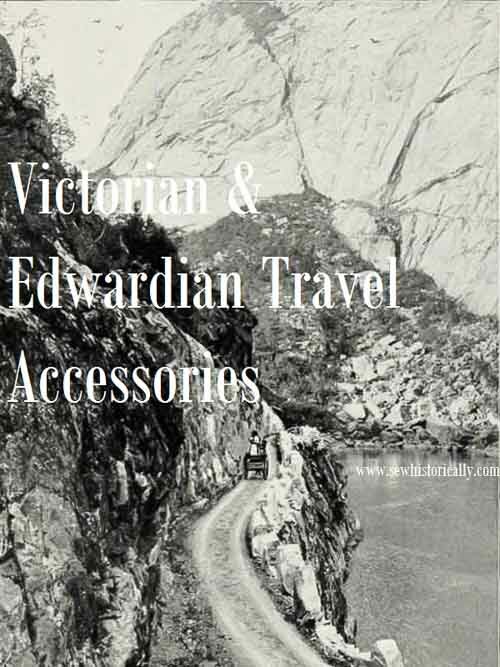 So Victorians and Edwardians needed many travel accessories. Some Victorians and Edwardians bought their travel accessories while some made their own. 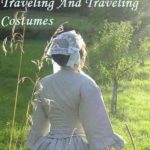 Below you’ll find a round-up of Victorian & Edwardian travel accessories with instructions on how to make your own! 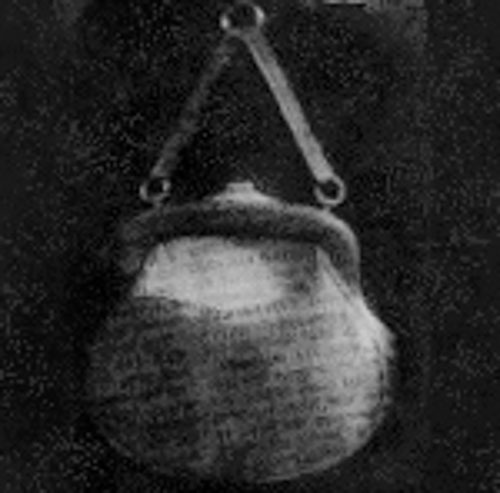 ‘Carpet bags should be purchased with large gores at the sides, as when thus made, they contain many more articles, and more conveniently than when they are only two plain pieces of carpet. They should also have a brass plate. 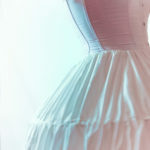 ‘This is made of Holland, calico, or thick cambric, or glazed muslin, and sometimes trimmed all round with a frill, or piped with coloured calico. It is intended to contain the night-gown, cap, also the dressing-gown, and perhaps a change of linen, and the tidy or dressing-case, and may be made to any size, according to the number of things it is intended to contain. ‘In commencing to make a canvas bag as used by sailors, a double seam is sewn down the side of the bag, and it is then a canvas cylinder. To get the radius of the circle for the canvas bottom, measure the width of the bag while flat on a table and add 2 in., and divide by 3. Make a loop of twine to this size, stick a sail needle into a piece of canvas, and with pencil and twine describe a circle about 2 in. greater in diameter than the bag. Now shorten the twine 1 in. and make another circle, cut out the canvas bottom to the outer circle, turn in 1/2 in. of the edge of the bag and sew a round seam with needle and twine, keeping the doubled edge to the inner pencilled circle; turn the bag inside out, and flat-seam the bottom edge to the side; this makes a neater job, though the one seam alone will suffice. 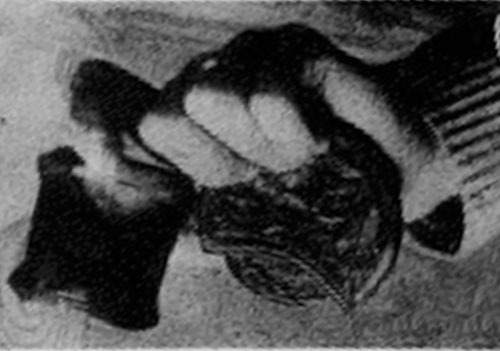 For securing the top of the bag, sew a leather strip on the top edge of the canvas just as braid is put on cloth; then to the side seam, just below the leather, sew a strap to encircle the neck tightly and fasten with a padlock, the strap being furnished at its ends with hasp, etc., to take the padlock; the leather edging cannot be pulled under the strap. ‘The regulation traveling bag is one of the most serviceable of the chain purses, and it is beautifully neat as well, which counts for so much these days. Besides all that, it kills two birds with one stone, as it serves as a handbag and a purse all in one. It is rather large and is generally divided into two parts, one for money and the larger one for any of the numerous little odds and ends that, one needs for a short trip. The outside pocket is a fit and fine place for tickets, as they are easily got at, and nine times out of ten when the conductor comes along everything else is in evidence but the thing most needed. ‘Woman is a strange personage and she is very apt to carry her valuables in a peculiar place, to say the least. It is no once-a-year sight to see a woman moving about in a mysterious fashion, and if you are one of the initiated you know that her little horde is securely fastened with a huge pin at the top of her hosiery. Unless she is careful you might see a powder puff and an extra handkerchief, for that is the one place where everything and anything may be carried with all possible safety. 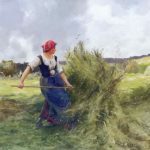 ‘Every one has among the unmade odds and ends in the attic or store room for which a use is expected to be found some day a number of pieces of cotton goods which have been left over from summer dresses or the curtaining and upholstering of summer parlors or bedrooms. They are not so valuable as the pieces of silk and velvet from which sofa pillows, hand bags and numerous dainty costume accessories may be made, nor is it of much use to keep them to mend the gown or curtain of which they have been a part, because cotton things are not expected to last many seasons in the first place, and in the second because making them over with new goods to help out is usually impossible as the difference caused by fading is too apparent. Still, the pieces accumulate, and the patterns are so pretty and the coloring so fetching that one treasures them long after the costumes which they match have gone into the rag bag. ‘These are most useful things, and no one who has once used them will travel without them, unless they can conveniently carry a dressing-case with them. They are made of Russia duck, ticking, or stamped cloth, or any other firm material. In making up, the greatest exactness is required to make the parts fit truly. 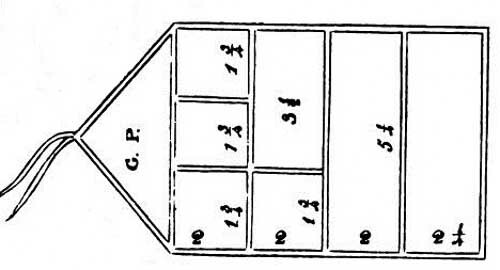 The back, which is all in one piece, is lined with strong calico, and the various pockets are then laid on, the bottom of one being sewed a little below where the top of the next will come, so that the whole has a neat appearance: the sizes of the pockets, given in the Plate, allow for this wrapping over. The top of each pocket is bound with purple or other coloured galloon, and the divisions for the smaller ones are formed by stitching a piece of narrow galloon neatly down upon them. The whole is then bound round with galloon, and strings of the same colour fastened to the pointed end, so as to tie round the dressing-case when it is full. As purple galloon will wash well, it is best for this purpose, as most other colours fade. 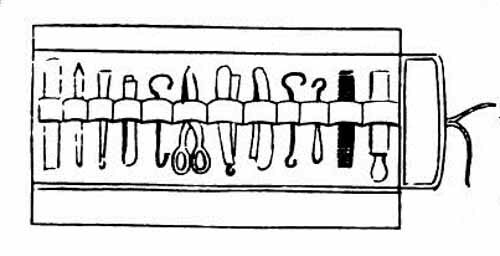 ‘A hatpin case is a useful present for the woman who travels, as it keeps the pins together and prevents their loss – a great consideration in these days of elaborate and expensive hatpins. The case may be carried out in any material you like. Its measurement is that of the ordinary hatpin, allowing an inch for the reception of any extra long ones. ‘Shoe or brush and comb bag. These are very convenient in travelling, as they save much paper, and take up little room, they are made of different materials, according to the shoe to be put in. If for walking shoes, a coarse brown canvas called earn, is the most suitable. For house shoes, calico or Holland, and for satin slippers, old silk. ‘Probably most of the girls who read this book know what shawl-bags are like, and also know their usefulness. They are not only capital things to protect shawls from dust and cinders in travelling, but may be used as another hand-bag, to carry small articles in case of need. 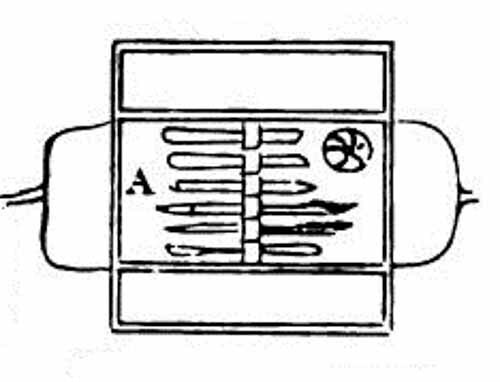 ‘This sort of case is very useful for men in all classes when travelling, and for school boys, and is usually made of Russia duck, or of leather; it is one yard long, and about one nail and a half or two nails wide. The pockets and thread-case must all be prepared before sewing them to the back. 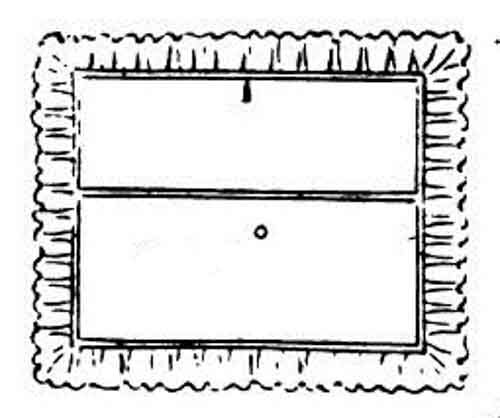 A is divided, according to the Plate, for the thread case as in a housewife, it is about four nails long, and has two flaps, C and B, at the ends, to keep the thread neat. 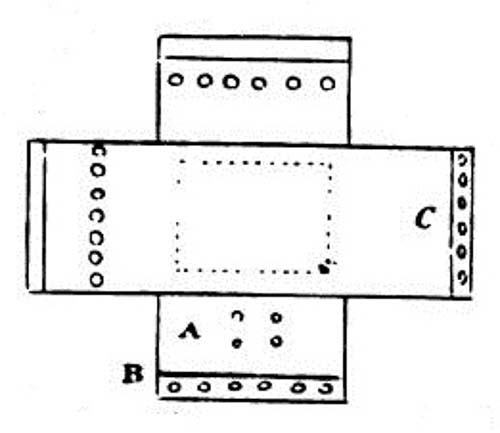 The flap, C, is finished inside, as seen in Fig. 43, with boot-hooks, &c., &c. The thread should be strong white, strong black, whity brown, carpet thread, pack thread, and other kinds, also white and black silk. 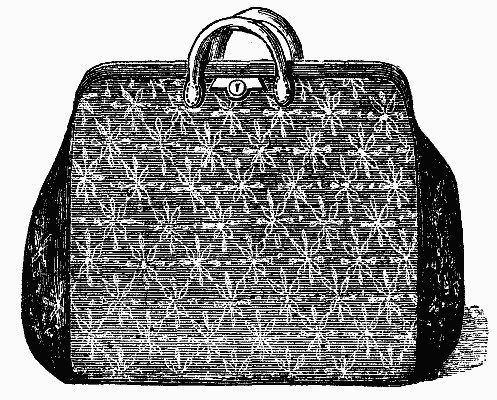 ‘A travelling bag is very useful for ladies, when taking long journeys, especially when they are fond of working or sketching while in the carriage. The Fig. represents both sides of the bag complete, excepting that it requires the sides to be sewed up. It is thus laid open, or unsewed, in order to explain the plan more clearly. The bag should be made of rich strong silk, and on one side pockets are made to contain as follows: A. Needle book or housewife. B. Scissors. C. Work and cotton. D. Pocket for money. E. Ditto for watch, or gold, &c. On the other side, the pockets are as follows: F. For a note book, or journal. G. For two pencils. H. Sketch book. I. Rules. J. Knife. 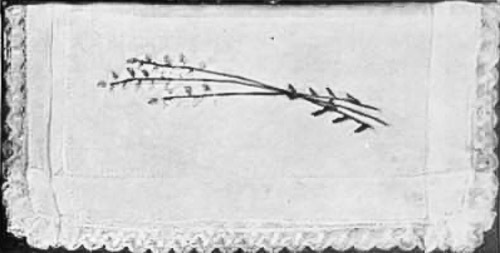 ‘This is made of coarse sacking or earn, and is most useful for covering large trunks, and is composed simply of two lengths of the stuff, laid one across the other, and stitched firmly together, exactly where they fall upon each other, forming an oblong or square of back-stitching, as in the plate, of the size of the bottom of the trunk. Four holes should be made in one of the sides, on which the direction card may be more easily fastened (see A). 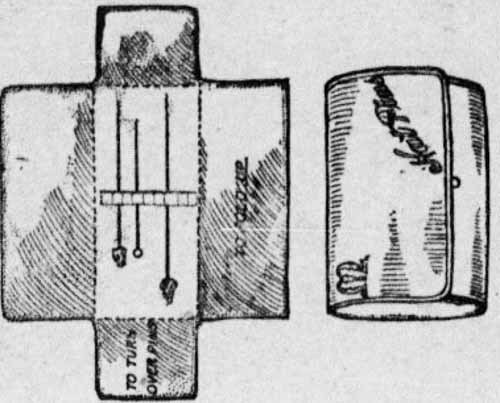 The ends are turned down with a broad hem, and buttonholes made on the hems of the two ends, B and C, and at two or more nails firom the hem at the opposite sides. So nice to see your article on traveling accessories of the Victorian and Edwardian era! Happily pinning to my Road Trip! Plane Trip! and Period Dress boards for our readers. Absolutely loving this great historical traveling info. So helpful for those of us who write about days gone by. Thanks, Barb! So glad you found it helpful! Such a cool post, I never knew about some of the travel accessories. So glad I saw this! I always look forward to your posts. You offer a unique perspective and I love all things vintage. Thanks for sharing at Reader Tip Tuesday.